Since returning from London Film Festival, I made it a priority to see Sarah Gavron’s Suffragette. It should be a priority for everyone to see this film, especially given that it’s the first ever theatrical feature film to tell the story of the suffragettes. Gavron and writer Abi Morgan chose to focus on the lives of working women in 1912 in East London, as a title shot at the opening of Suffragette makes clear – an indication of their awareness of the omissions in the film, such as any representation of women of colour who also had a large part to play in women’s suffrage. This conscious decision to base a film on a specific faction of the movement serves the film well as it allows a human drama to be the relatable centre of what was very tough and complex time. Still, perhaps Suffragette should be only a starting point for more films on the subject as there is undoubtedly so much more to learn. The film itself is a solid drama, and Carey Mulligan as Maud Watts, who sacrifices all she has for the cause of equality, gives a sympathetic and passionate performance believably showing her character’s journey from passivity to action. Despite this, and committed performances from the rest of the cast, it’s hard not to feel that the filmmakers have played it safe. On one hand, a solid, well structured, classic narrative is exactly what the subject needs to make it accessible to as wide an audience as possible. On the other hand, it’s hard not to come away from the film feeling that the last sequences – documentary footage of suffragettes in action – are the most interesting part of Suffragette. Perhaps Make More Noise! Suffragettes in Silent Film from the BFI’s National Archive (released in venues across the UK from October – December) will provide further inspiration. Elsewhere, I decided to catch up on some British rom-coms I’ve missed in recent years. Man Up, written by Tess Morris and directed by Ben Palmer (responsible for The Inbetweeners Movie) stars the hilarious Lake Bell (who you’d recognise from Wet Hot American Summer and too many other film and TV roles to mention), and Simon Pegg. Bell plays Nancy, a thirty-four year old journalist who is on her way to her parent’s fortieth wedding anniversary when she accidentally takes the place of forty year old Jack’s (Pegg) blind date at Waterloo station. Due to a resolution to put herself ‘out there’ she decides not to correct Jack’s mistake and the two have the date he was meant to have with a twenty-four year old banker. Of course, they actually get along really well, despite their different outlooks on love (he’s post-divorce, but optimistic, she’s cynical) and some shared cultural references including a love for The Silence of the Lambs, sparks chemistry that inevitably leads to their third act union, despite the one big deceit that their meeting is based on. It’s very predictable, but then rom coms never set out to be anything but, and provides a diverting ninety minutes that’s mainly enjoyable due to Bell’s brilliantly physical performance. 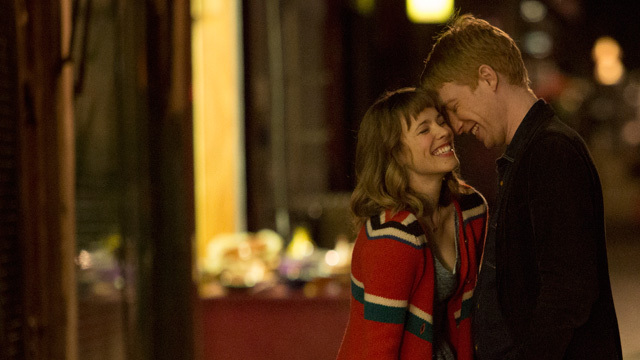 About Time (2013), on the other hand is deeply problematic. Richard Curtis’ third feature as writer/director is just as shamelessly romantic as Love, Actually but reveals the blatant male privilege at the heart of his films. Domhall Gleeson plays Tim, who is told by his father (Bill Nighy) soon after his twenty-first birthday, that he and all the other men in his family have the ability to travel back in time. Just what white men really need then, an advantage over everyone else. Tim uses his power to find a girlfriend and becomes happily coupled with Mary (Rachel McAdams). He makes mistakes along the way, but generally, he lives a charmed life. His sister Kit Kat (Lydia Wilson), on the other hand, is troubled, drinks a lot, can’t keep a job and needs her big brother to save her. Though Curtis’s screenplay seems to cover its main flaw by having Mary and Tim’s first meeting take place free from any advantage (they meet at a blind restaurant – is that a thing? ), so that their chemistry is demonstrably authentic, Mary remains a character who is manipulated into perceiving a false version of Tim. His mistakes are corrected with ease and the course of their courtship runs ever smoothly. Women are excluded from this ability to make the best of their lives. There’s even a scene in which Tim does transfer his power to Kit Kat, but the result of this puts his life a risk, so he reverts back to keeping his power a secret. Imagine if both Tim AND Kit Kat had this power instead? How fascinating it might be to see brother and sister with an equality of opportunity in life, a social experiment that sees how each gender chooses to improve upon their decisions – THAT I’d like to see. Also viewed: Silence of the Lambs, X-Men: Days of Future Past, This Must Be The Place.